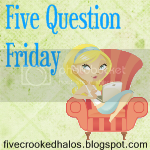 Just when I think I might do something else for a Friday post, I check out Mama M.'s questions and they are just so much fun to answer... so here I go! Once upon a time there was this 16 year old girl named Lily. She was dating a... not-so-nice guy. She was ready to take her driver's test but didn't have a car of her own so she decided to take her boyfriend's pick-up truck. This truck had extra large tires that Lily did not realize made turning a little difficult. So Lily takes her test... thinks she did okay. Not so fast... says driver-test lady. okay, so Lily was a tad upset. She had never failed a test in her life. He tells her that she is being a big fat baby and says she is stupid for being upset. So sorry I didn't end up with that guy. hmmm latest one, I slipped and fell when I was bowling a few weeks ago. Like, went to throw the ball down the lane and my legs slide right out from under me. That's always fun since, you know, EVERYONE is watching you... and there are about 15 other lanes full of people that see you hit the floor as well. Right now it would be What Not to Wear...FOR SERIOUS. I am actually writing a post about my wardrobe woes so stay tuned for that in the near-future. twins in a 5'1 body... nuff' said. All my favorites are Express jeans that I have had for about 5-6 years... Although the last few times I have been to the store, most of their jeans are ***bedazzled*** out... which I am just not into.